Headlines: The fishing has been improving dramatically in the lakes with some great reports. The rivers are set to open very soon also have good water and plenty of nice fish to be caught in a couple of weeks. We have received a large order of Columbia shirts, hats and pants this week in preperation for the season. Now is a good time to buy with plenty of sizes and colours to choose from. Lake Eucumbene continues to rise and is now at 26% plus! This the highest it has been for three years and the lake has already started to fish well for bank anglers and should get better and better with time. 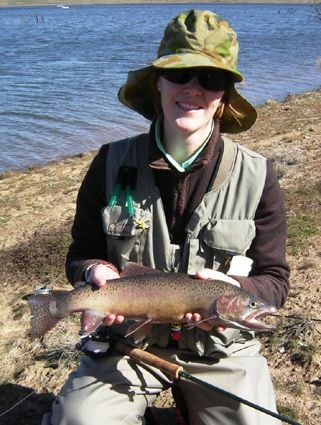 *Pictured below is Annette from Canberra with her first Rainbow on fly. At 51cm it is a great fish and was taken on the weekend. She used flies as per our fishing report from last week. Jindabyne:- Jindabyne trolling reports have been quiet this week. After a long period of nil supply we now have wood grubs back in stock. They make a great winter trout bait in the lakes. *Ken Caine from Berridale had a very good session Friday night in the Buckenderra area. He hooked eight fish, landed six and missed another three on the take. Best fish were a 1.5 kg brown and a 1.4kg rainbow. Baits used were scrub worms and orange pulp Gulp and sherbert Powerbait. The fish were full of drowned insects and the brown had lots of immature mudeyes in its stomach. *Mad keen bait fisher Johnny scrubworm took friend Tanya out for a fish in the Buckenderra arm on the weekend and despite the howling gale they still managed to get some very nice rainbows. Tanya lost a cracker of a rainbow but made up for it with two very nice fish shortly after. Scrubworms were the best bait.